Most Important: GTU CCC Seven Stage Registration Date not declared on official site. Avoid fake massage published on Social media like whatsapp and Facebook. Official date will be declared soon at official site ccc.gtu.ac.in . So candidates who are waiting for ccc exam are advised to keep visit official portal or this page for future update about GTU CCC Online Registration Date. ccc.gtu.ac.in Gujarat Technological University has been announced notification of CCC Exam Online Form 2015. All candidates who are waiting for this exam can fill online application on or before last date. The Gujarat Technological University (GTU) is a public state university. The university is located at Ahmedabad, Gujarat, India. The university was established to ensure more efficient, and systematic imparting of technical education. CCC exam is a mandatory computer examination being held for the promotion to get higher pay scale and regularize in the current job of State Government of Gujarat. Check your photo, Application No and Bar code then print the generated form. Note: Candidate has to submit the application form along with fees challan (Depositor Copy) to GTU on or before last date. Last time GTU CCC Exam Sixth stage registration has started on 31-12-2014. Now The department will be declared Seven stage online registration date soon on official site ccc.gtu.ac.in . 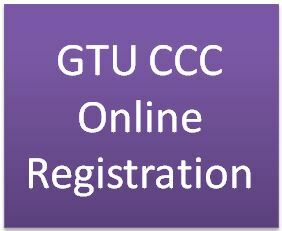 So candidates are advised to keep visit official portal or this page for future updates about GTU CCC Online Registration date 2015.